Product #18298 | SKU CUE-D150 | 0.0 (no ratings yet) Thanks for your rating! The CUE-D150 from IDX is aimed at the Digital Cinematography market where high current loads of 10A/120W are required with a need to drive peripheral equipment via an in-built D-Tap connector. Built to Japan’s stringent PSE regulations, the CUE series sets the standard for mechanical and electrical safety. The CUE-D150’s high capacity of 146Wh gives extended running times whilst being under the 160Wh IATA limit for carry-on aircraft baggage. 1 x (D-Tap) DC output connector capable of taking a 50W load within the maximum battery draw of 120W. Battery circuit protection ensures the CUE-D150 is fully protected against common causes of battery misuse, guarding against over charge, over discharge, over current and exposure to high temperatures. Attaching CUE-D150 batteries to cameras without a standard V-Mount connection is possible through the use of P-V2 and P-VS2 adaptor plates, available separately from IDX. 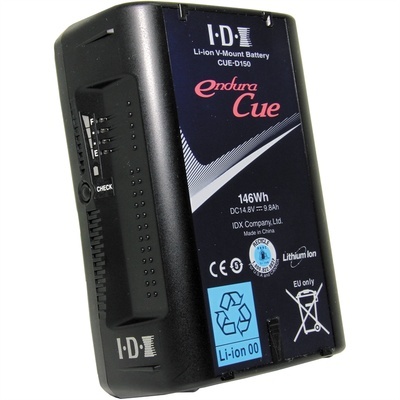 The CUE-D150 is fully compatible with all ENDURA V-Mount chargers and accessories.